Lack of reliable data on Unión Eléctrica (UE) makes analysis of the energy sector in Cuba very difficult. The basic methodology used in this paper was to combine official data with knowledge of power systems in other countries and the use of international prices to value tradable goods. The data presented should be considered first approximations, subject to revision. The Cuban power sector has suffered since the collapse of the Soviet Union, but Venezuelan subsidies have compensated this loss to some extent with support estimated between $3 and 4 billion annually. After the blackouts of 2005–06, the Government of Cuba embarked on a program to reduce electricity consumption and to expand capacity to generate power, which they called the “Energy Revolution” (or Revolución Energética). The energy conservation program was reasonably successful in reducing daily peak demand but the results in terms of expanded capacity are mixed. The installation of about 1,200 MW of gensets is an extremely costly solution if fuel is valued at its international price. On the other hand, the gasfired generation plants established under a Power Purchase Agreement (PPA) with Canadian company Sherritt as a partner has been a highly positive development, as generation costs and pollution are significantly lower. UE uses mainly liquid fuels, which result in very costly generation at today’s crude oil prices and it has very high technical losses (15%) as well as very low labor productivity. Without subsidies and with crude oil prices at $140 per bbl, UE’s annual economic loss would be almost $3 billion, as the rates it charges its customers are significantly below full cost recovery rates. During a transition, a major reform of the sector would be necessary to encourage private investment that would lead to increased efficiency. A well-designed reform of the sector, including full privatization of the assets of UE, could take 3–5 years. Additionally, to reduce risk related to volatility of crude oil prices, a system of incentives to decrease reliance on liquid fuels should be implemented. Since the beginning of the revolution, the electric power sector (referred to hereafter as power sector) of Cuba has been developed without much regard to financial and economic considerations.2 This approach to the power sector has had a long history in the communist bloc as the sector was considered to have a preeminent political dimension. For example, Lenin said: “Communism is Soviet power plus the electrification of the whole country.”3 Many other quotes by Lenin make the same point. In Cuba’s hydrocarbon sector, the situation is somewhat different, as there has been significant private participation in exploration and crude oil production beginning in the 1990s. At the same time, international trade in oil and derivatives, refining, distribution and pricing do not seem to follow financial and economic considerations. This lack of concern for financial and economic issues may result from the fact that both the Soviet Union and Venezuela have provided large subsidies to Cuba by supplying oil and derivatives at concessionary terms, and Cuban economic policymakers do not seem to take into consideration, at least in the energy sector, opportunity costs. The power and hydrocarbon sectors are inextricably linked, as Cuba produces about 85% of its power using liquid fuels, a very high percentage.4 The total value of the modern energy sector of Cuba has been estimated at 14% of GDP, compared to about 10% for the world. 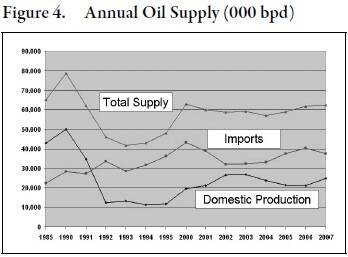 In 2007, domestic production of crude oil accounted for about 40% of total consumption, and the rest was imported from Venezuela. From the total supply of fuel oil, about 50% is used for power generation and 50% for transport and other uses, not an uncommon proportion in other countries (Table 1). Analysis of economic issues in Cuba is severely hampered by lack of reliable data. Also, the dual monetary system imposes important conceptual difficulties, as it is very difficult to compare financial flows in U.S. dollars with financial flows in pesos. In the paper, an exchange rate of one peso per one US$ is used. The financial analysis carried out on this paper should be considered a first approximation, and more research should be carried out to refine the numbers, an important task given the importance of the energy sector in the Cuban economy in general and in the fiscal accounts in particular. Electricity generation capacity in Cuba increased from less than 400 MW in 1958 to about 4,000 MW in 1990, an annual compound rate of growth of almost 12%. 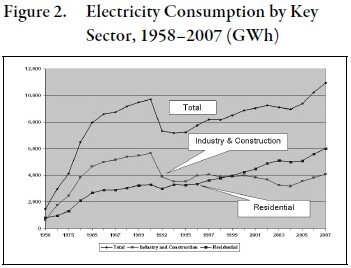 During the same period, total electricity consumption grew from about 1,500 GWh to almost about 9,700 GWh, an annual rate of growth of 6% (see Figure 1). When Cuba lost Soviet assistance, which was estimated at US$ 5–7 billion per year, it suffered a sharp decline in GDP that was accompanied by a sharp decline in energy consumption per capita in the period 1990– 95 (Figure 2). Most of the decline is accounted by a drop of consumption by “industry and construction,” as other types of consumers, including households, did not curtail consumption. 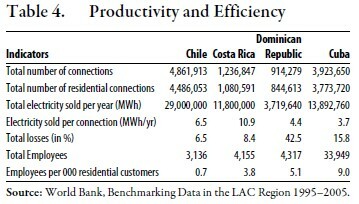 Figure 3 compares per capita electricity consumption rates in Chile, Costa Rica, Cuba and the Dominican Republic. It is interesting to note that while Costa Rica, Chile and Cuba had similar consumption per capita in 1990, consumption in Chile and Costa Rica today is significantly higher than in Cuba. It is also important to note that Chile, which relies mostly on private investment in the power sector, increased generation much faster than Costa Rica, where the private sector plays a minor role in the power sector. Cuba’s electricity generation capacity increased from about 3,800 MW in 2004 to about 5,200 MW in 2006, an annual rate of growth of 17%. This sharp increase is partly the result of the gas-fired generation of 495 MW installed by Sherritt under a Power Purchase Agreement (PPA) with Unión Eléctrica (UE) 6 and the installation of 1,200 MW using small gensets. The gas-fired 495 megawatts of installed capacity produce about 15% of total power at a low cost and with minimum carbon emissions, in contrast with the 1,200 megawatts of small gensets, which have high operating and maintenance costs and high emissions. Consumption of hydrocarbons increased rapidly from 1958 to 1990, and then consumption plummeted as the subsidies from the USSR collapsed (during the “Período Especial”). Curiously, while the government claims that GDP has been increasing rapidly during the past five years, oil consumption has been flat. 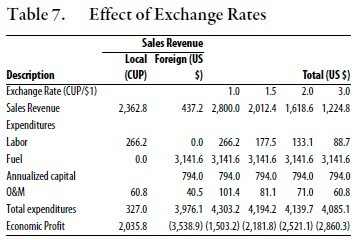 This is just one more anomaly of Cuban economic data (Figure 4). Financial data on UE, the vertically-integrated utility providing power to most of the country, are not readily available. Using information from multiple sources, financial statements for UE were developed and analyzed. This analysis must be considered a rough approximation of the actual financial situation. • Total value of sales: US $2,800 million.7 Applying present rates to net sales (total sales minus losses and minus plant load) results in a figure of US $2,000 million. • Estimated total value of assets: $6.8 billion. • Annualized capital cost (i = 10%; n = 20 years): $794 million. • Number of workers: 33,950. • Total wage bill: CUP 266 million. • Total use of fuel for power generation: 28 million barrels. • Average cost of power generation fuel at international prices in 2007: $112/bbl. On this basis, the economic profit and earnings before interest, taxes, depreciation and amortization (EBITDA) were calculated for 2007, a year when the average price of crude oil was US$ 87/bbl (see Table 3). In that year, UE’s economic profit was estimated at about negative $1.5 billion and EBITDA at about negative $710 million. With fuel discounted by 40%, EBITDA would be about positive $550 million.8 At present crude oil prices (US140/bbl),9 even with a fuel discount of 40%, EBITDA would be about negative $340 million. It is alleged that Cuba does not pay for Venezuelan oil. If that were the case, the EBITDA for UE would exceed US$ 2,000 million, even if Cuba were to pay international prices for the proportion of domestic oil that belongs to the private companies involved in the Production Sharing Agreements (PSAs). UE is an inefficient enterprise by international standards, with very low labor productivity, high losses and over-reliance in liquid fuels. Table 4 summarizes key indicators for UE and compares Cuba’s power sector with that of Chile, Costa Rica and the Dominican Republic. 10 Employees per 1,000 connections at UE are 9.0, compared to 5.0 in the Dominican Republic, 3.8 in Costa Rica and 0.7 in Chile. Losses, which are mostly technical as there is almost no energy theft in Cuba, are 140% higher than in Chile and 88% higher than in Costa Rica. 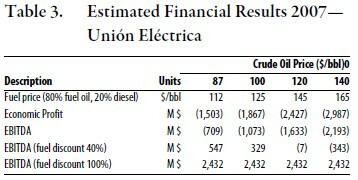 Losses in the Dominican Republic, a country characterized by massive energy theft, are much higher than in Cuba.11 Most importantly, Cuba’s overreliance on liquid fuels (in 2003, Cuba was ranked number 5 in the world in terms of percentage of total energy derived from liquid fuels), results in very high unit generations costs as fuel accounts for 70–80% of total generation costs. Table 5 shows unit electricity costs as a function of crude oil prices. Even if losses were eliminated, costs per kWh would be about $0.33 (crude oil at $140/bbl), costs that would make almost any economic activity uncompetitive in international markets. 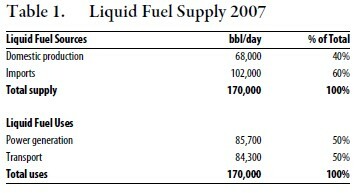 At present crude oil prices, fuel accounts for about 80% of total electricity costs (Table 6). While increases in labor productivity and reductions in losses can reduce costs per kWh, major reductions are not possible unless fuel costs are reduced through greater plant efficiency and by moving to other less costly sources of generation, including renewables. In order to determine the effect of different exchange rates on the financial and economic results of UE, sensitivity analysis was carried out and is summarized in Table 7. As would be expected, higher exchange rates make the situation worse. Power at reasonable rates would be absolutely necessary for the economic recovery of Cuba. Power is also necessary for health and education and for the provision of potable water, which in turn is necessary for promoting public health. Power has the characteristics of a private good, i.e., consumption by one individual subtracts from the supply that would be available for another and it is easy to exclude consumers from its use. Given that a transition Government of Cuba (GOC) will need to increase sharply the provision of many public goods such as the administration of justice, it should not give particular emphasis to the provision of private goods. Therefore, a priority should be given to charging sufficient rates for power and to policies designed to introduce private investment as soon as possible. This section summarizes previous papers written by the author. Power rate increases will affect real incomes of the poor and must be coordinated with the establishment of a social safety net and the establishment of life line rates or other mechanism to ensure that the poor are not hurt too much by the necessary increase in power rates. An infrastructure reform strategy should be developed by the authorities, and should address issues not only of the power, telecommunications and waters sectors, but also should deal with roads, ports, and airports.13 Consultants could assist in the formulation of the strategy. Other important activities would be visits by Cuban officials to countries that have reformed in Latin America (Chile, Guatemala, Peru, El Salvador and Colombia, for example) as well as countries in Eastern Europe (Czech Republic, Estonia and Poland, for example). This strategy could be completed in 3–6 months; periodic seminars involving civil society should be carried out to increase transparency. It would also be necessary to make a rapid assessment of the assets of the power company and the main water systems. The legal/regulatory framework for the different infrastructure sectors has to be developed and the laws enacted. A critical issue is the legitimacy of the authorities before free and fair elections are conducted. Once the laws are enacted, a multisector regulator should be established and staffed. The staff will require training on the job as well as abroad. Good possibilities for training abroad include the Public Utilities Research Center of the University of Florida (PURC) and the Kennedy School of Government at Harvard (specifically the course Infrastructure in a Market Economy). The regulator can also be supported by foreign consultants who would also provide on the job training. Additionally, partnerships with U.S. under the National Association of Regulatory Utility Commissions (NARUC) with a U.S. state regulator could be a powerful instrument for enhancing the skills of the staff of the Cuban regulator. The specific reforms of the power, telecommunications and water sectors are discussed below. 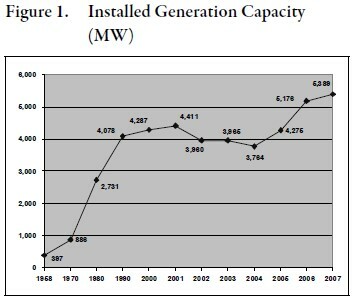 While in 2005–06 Cuba faced blackouts, the situation has improved markedly as a result of conservation measures, the installation of additional gas-fired generation and the installation of about 1,200 MW of small gensets, although these gensets are a very high cost, short-term solution. The first priority for the authorities would be to introduce measures to avoid asset stripping and tunneling. The second priority would be to perform an emergency rehabilitation program of crucial infrastructure components to ensure the availability of power to critical facilities. Depending on the willingness of the managers of UE to implement measures to increase efficiency and safeguard the assets, two programs of external support could be considered. Under Plan A, the GOC would seek international support to bring in consultants to help UE improve financial management, billing, Information and Communications Technology (ICT) systems, etc. For this plan to be effective, the managers of UE must be fully supportive. Under Plan B, the authorities may choose to develop some form of performance–based management contract. These contracts should: (1) be awarded through an International Competitive Bidding (ICB) process; (2) they must give operators control to be able to manage the business, including reducing staff; and (3) managers and employees should get financial gains from better performance. The lessons learned form USAID’s study of operations contracts could be a valuable input for the design of a contract for UE. To achieve a competitive market, it is first necessary to unbundle the sector, i.e., to separate generation from transmission and from distribution. In a market the size of Cuba, three to four distribution companies would have to be formed. Each major generation plant is of a sufficient size that they could be become a separate enterprises. Limits on vertical integration, i.e., prohibition of ownership of generation and transmission, and horizontal limits, i.e., maximum ownership of generation assets as a percent of total system generation, would be advisable. A complex issue is whether it is advisable to have a transmission company separate from the system operator. The different alternatives are discussed thoroughly in Sally Hunt’s excellent book Making Competition Work in Electricity. One option is to combine transmission and system operations in one company (which we call Transco), such as the National Grid Company in the United Kingdom. This is also the model in Spain and Scandinavia. The other option is to divide the system operation into an Independent System Operator (ISO) and a separate transmission company (Gridco). This is the model in Argentina and in many parts of Australia. The determination of the most appropriate model for Cuba has to be the result of an intense dialogue between the authorities and consultants. Privatizing the power sector is, by necessity, a lengthy process. The privatization process must be carried out competently and with a high degree of transparency, including consultations with civil society. The privatization of Chile’s power sector, the first such privatization process in Latin America, took almost 10 years, while Argentina’s took two years. In the case of Cuba, where many of the necessary institutions do not exist, such a process would take between 3–5 years. The sequence of privatization of the different components is also important. After laws have been enacted and the regulator has been established, it is important to adjust rates before privatization takes place. The recommended sequence is to privatize the distribution companies first, after rates are at—or close to—cost recovery. After these rates have been market-tested for a few months or a year, the generation companies can be privatized. Given that the main clients of the generation companies are the distribution companies, it is important that they are in a strong financial position before the generation companies are privatized. It is best to keep transmission in the public sector, and the system operator can be either a state-owned enterprise or owned jointly by all market participants, including the government. Natural gas. Viability would depend on domestic availability of gas unless volume can justify a degasification facility to process imported liquefied natural gas (LNG). Biomass and biofuels including alcohol and bagasse. This will depend on a resurgence of the Cuban sugar industry. Wind, which is becoming more competitive today. Cuba just installed 5.1 MW in Gibara, in the Holguín region, and that there are plans to install up to 100MW. Mini-hydro potential is fairly limited, but should be developed wherever possible. Solar based on photovoltaic cells is still high cost except for some specialized applications; concentrated solar may be an option in Cuba. Coal. As Cuba does not have coal deposits, using this fuel would require the development of bulk cargo port facilities. Presently, several countries in Central America are considering this option. Tariff free imports of machinery and equipment for renewable generation and reasonable tax breaks could reduce over-reliance on liquid fuels. These incentives have to be well-designed to avoid the establishment of costly generation plants. 1. The opinions expressed in this paper are those of the author and do not represent the views of the U.S. Government. 2. This paper is the fourth that the author has written dealing with power sector issues in Cuba. Readers interested in more background information on the lessons learned from power sector reform in Latin America and the former communist countries of Europe and Central Asia as well as on the power sector of Cuba may want to consult these papers (Belt, 2000, 2006, 2007). The present paper summarizes the most recent information of the sector and carries out an economic and financial analysis of UE, the electricity utility in Cuba. The author would like to thank Luis Velazquez for his support in the preparation of this paper and Elizabeth P. Belt for comments. The author is solely responsible for any errors. 3. Vladimir Ilyich Lenin, “Report on the Work of the Council of People’s Commissars,” Dec. 22, 1920 (1920), reproduced in Collected Works, vol. 31 (1966). Cited in The Columbia World of Quotations. 1996. 4. In 2003, Cuba produced 93% of its power using liquid fuels, the fifth highest percentage in the world. The decline in that percentage is the result of new gas-fired facilities established under a Power Purchase Agreement (PPA). 5. 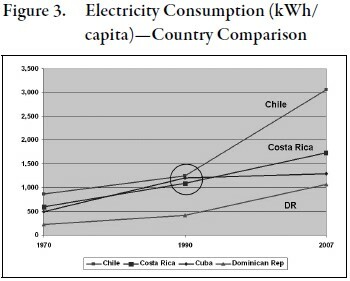 The conclusion that Cuba has a higher consumption of electricity is based on a regression of the natural logarithm of electricity consumption as a function of the natural logarithm of GDP per capita (PPP basis). 6. Sherritt is a private Canadian company that is also involved in Cuba in the upstream oil business and in nickel mining. 8. Officially, Cuba buys oil from Venezuela at a discount of 40%, and that is roughly the proportion of domestic oil that belongs to Cuba under the Production Sharing Agreements (PSA). 9. At the prices prevailing when the paper was written (July 2008). 10. Source: The World Bank—Benchmarking Data in the LAC Region 1995–2005. Data for number of employees in Chile seems too low. 11. Energy theft in Cuba is penalized with exorbitant fines and even prison. 12. This section is based largely on Belt and Velazquez (2007). 13. In the discussion that follows, it will be assumed that the authorities have requested support from bilateral and multilateral donors.